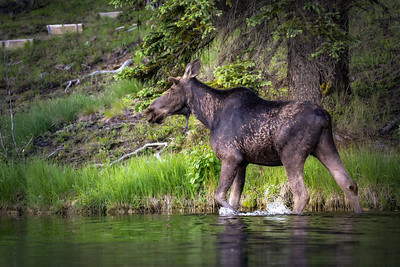 While kayaking, I spotted this large bull moose grazing along the shoreline in early spring at a lake in northeast Washington state. The winter coat was still being shed. The antler buds were small, but the size of the moose made me wonder if this beautiful bull would have a huge rack by the end of the season. 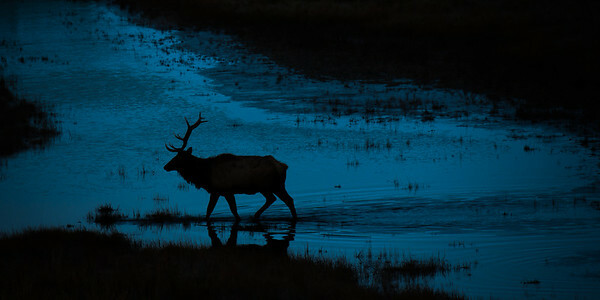 This bull elk traveling through the water created a beautiful scene early one morning in Yellowstone National Park. 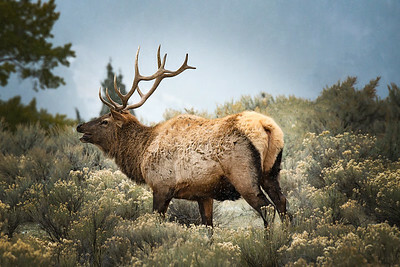 He and several cow elk were grazing in a large expansive meadow with wetlands. Though this looks like a winter scene, this scene was actually shot in mid October in Grand Teton National Park, while the autumn leaves were still on the trees. I spotted this bull grazing with another bull and cow moose just after dawn outside of Jackson, Wyoming. 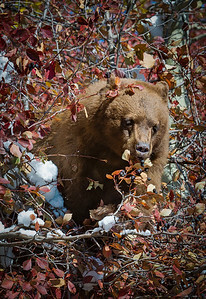 Though this looks like a winter scene, this scene was actually shot in mid October in Grand Teton National Park, while the autumn leaves were still on the trees. 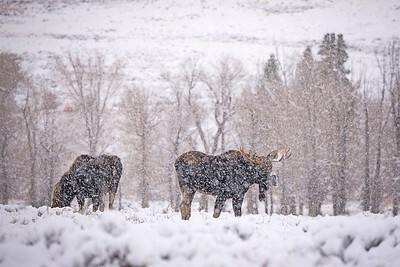 I spotted these three moose just after dawn outside of Jackson, Wyoming. 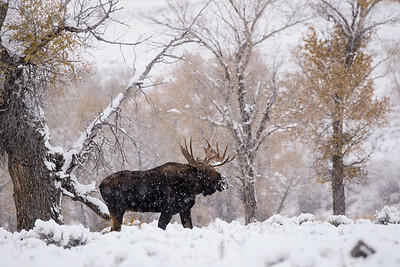 This bull moose was spotted outside of Jackson, Wyoming in Grand Teton National Park. Taken just after dawn in mid October, this large bull was grazing with another bull and cow moose. 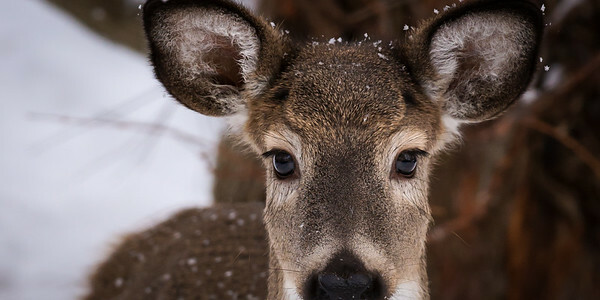 Snow had collected in the bowl of his antlers, and his muzzle was covered in snow from foraging in the snow. I have observed otters several times, and they never cease to entertain. They are busy, playful, and affectionate with each other. Though this one didn't intend to be funny, it periodically popped up out of the water with weeds on his head, and I couldn't help but laugh. This image was taken at a lake in northeastern Washington in autumn, golden tamarack trees reflecting in the water. 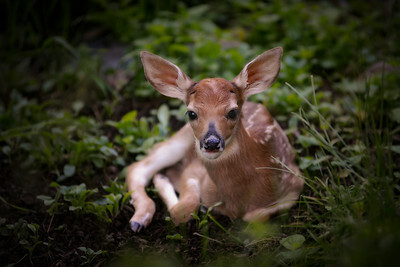 This newly born fawn rests in the shade while its mother grazed nearby. Image taken in northeastern Washington state. 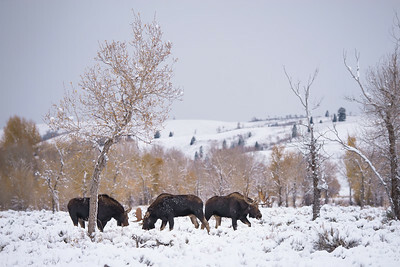 These three moose were foraging in a clearing in Grand Teton National Park. 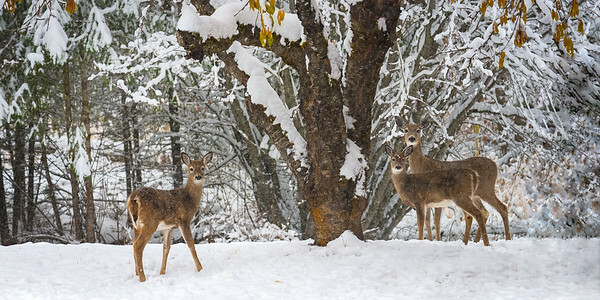 It looks like a winter scene, but it was actually shot in mid October after an early snow. Though at the tail end of rutting season, the two bulls were peacefully existing with no signs of aggression. 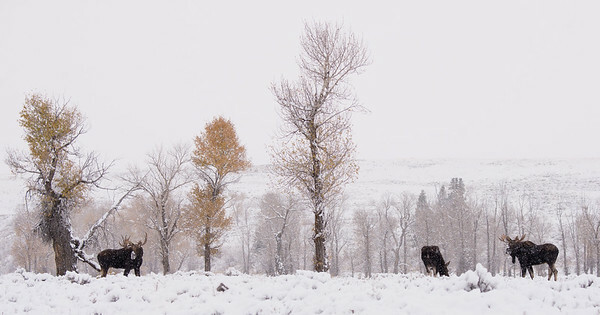 This bull elk is caught by surprise by an early snowfall in Grand Teton National Park in early October. A gorgeous scene with the snow falling amidst trees still laden with autumn leaves. 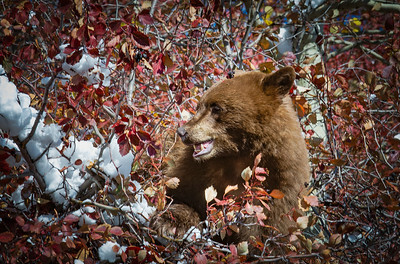 This cinnamon colored black bear cub was eating berries from the top of a small tree in Grand Teton National Park. An unexpected early snowfall hit overnight in mid October, so winter was fast approaching. 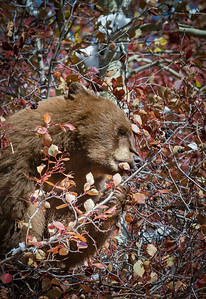 The cub used its claws to pull berries into its mouth, while precariously perched at the top of a fairly small tree. 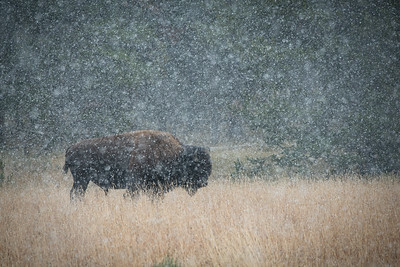 This bison in Yellowstone National Park forages in a meadow in heavy snowfall in mid October. 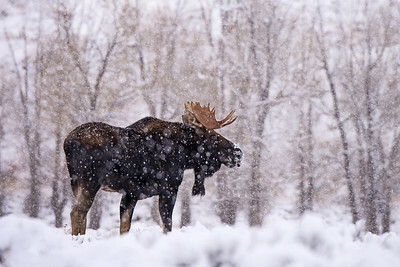 This winter whiteout of two moose was taken in mid October in Grand Teton National Park early one morning. 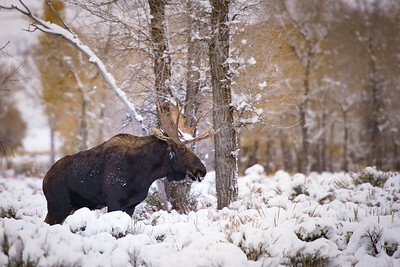 This beautiful and large bull moose was photographed one snowy morning in mid October in Grand Teton National Park. 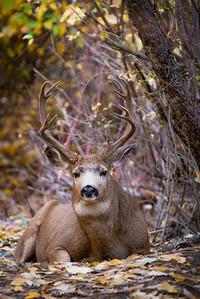 This majestic mule deer buck was in a thicket outside of Leavenworth, Washington, breeding with several does. 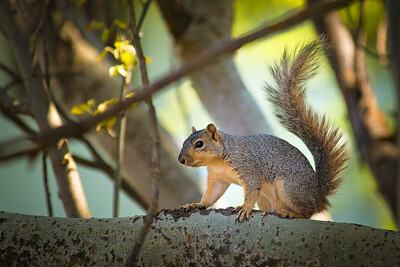 He was clearly worn out, and resting, giving me an opportunity for this shot. 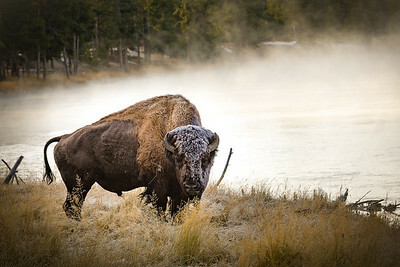 This frost laden bison was grazing along a river in Yellowstone National Park. The early morning mist created a surreal scene. 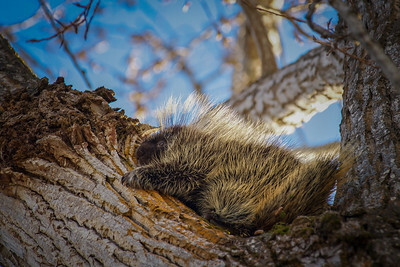 This porcupine was nestled in the crotch of a cottonwood tree sleeping. For a few brief moments, he uncurled, looked down at me...and then curled back up and went back to sleep. 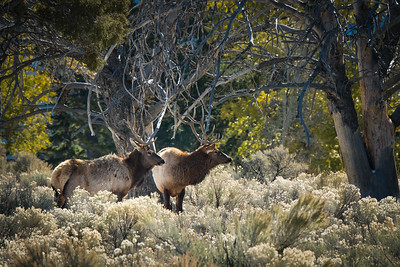 These two bull elk were sparring in Yellowstone National Park, but in between sparring, grazed in the afternoon sunshine together. 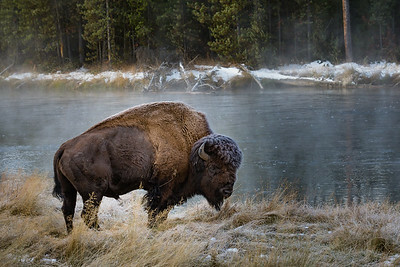 The detail of this bison shot in Yellowstone National Park is remarkable. 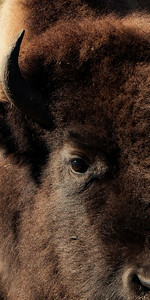 The head is huge, fur thick and dense, and are well suited to life in the sometimes harsh conditions of Yellowstone. 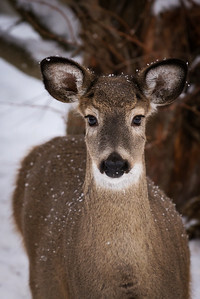 Most of the time, bucks don't stick around once they spot me, but this gorgeous buck in velvet stood still for quite some time and just looked at me in that beautiful pose. 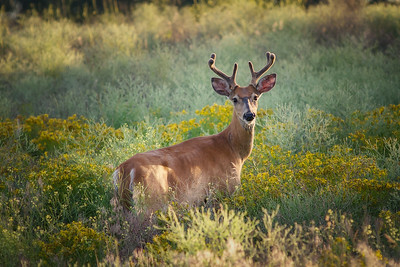 It was an early summer evening, and the golden hues and sunlight washed over him. 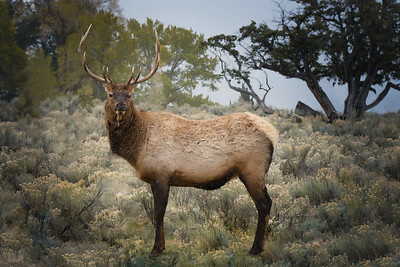 Shot in northeast Washington.